Cancer charities like Cancer Research UK are amongst the most worthwhile causes to support, in my opinion. Practically every single person on Earth is affected by Cancer in some way, whether it’s in suffering from it themselves or seeing a loved one afflicted. The eventual elimination of Cancer will be one of the crowning glories of human achievement, should it happen and it’s a brilliant goal to work to work towards. Of course, there’s probably never going to be a single solution to treat every variation but perhaps as we come to understand the human genome better and develop superior treatments like those outlined in the article above we’ll one day be at a place where ‘Cancer’ isn’t automatically thought of as ‘death sentence’. I wonder in what part cancer is such a big problem because of the things we consume (pesticides, herbicides, particulates in the atmosphere), and how much is due to an inherent problem in our genome. How many people on average died of cancer when someone aged 40 was considered to be a very old geezer, for example? Considering cancer is basically cell division gone haywire, how much of it is simply inevitable when longer lifespans mean the accumulated errors in cell division eventually add up to too big an error? University of Leeds researchers, funded by Cancer Research UK, have used a library of DNA to create a vaccine that could be used to treat cancer, according to a study published in Nature Medicine. Before now, 'gene therapy' vaccines have often delivered just one gene to stimulate the immune system. It produces a protein, called an antigen, which activates the immune system to destroy cancer cells. Scientists have also tried to boost the effectiveness of vaccines by using several genes to increase the chances of producing successful antigens. But a worry has always been that the immune system's response would be too strong for the body to handle. The team used doses of a vaccine made from a virus which contained a 'library' of DNA, containing multiple fragments of genes and therefore many possible antigens. This approach did not send the immune system into overdrive, which had been a concern. Instead the range of DNA meant the vaccine was able to target the tumour through many routes. Importantly, the DNA library was harvested from the same organ as the tumour. This meant that the immune system 'self-selected' the cancer antigens to respond to and did not react against other healthy parts of the body. Also, the process of self-selection was triggered when the vaccine was injected into the bloodstream, an approach to vaccination that is far more practical than injecting directly into tumours. University of Leeds' Professor Alan Melcher, co-author of the study, said: "This is the first time we've been able to use a whole library of DNA in a viral vaccine successfully. "The biggest challenge in immunology is developing antigens that can target the tumour without causing harm elsewhere. "By using DNA from the same part of the body as the tumour, inserted into a virus, we may be able to solve that problem." Professor Peter Johnson, Cancer Research UK's chief clinician, said: "This is an interesting and significant study which could really broaden out the field of immunotherapy research. "Although the vaccine didn't trigger the immune system to overreact and cause serious side effects in mice, it will need to be further developed and tested in humans before we can tell whether this technique could one day be used to treat cancer patients." Yeah I've just read about it on io9. Very cool. 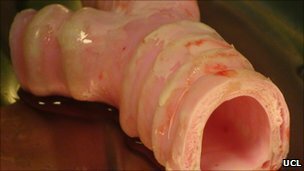 The key to the latest technique is modelling a structure or scaffold that is an exact replica of the patient's own windpipe, removing the need for a donor organ. To do this he enlisted the help of UK experts were given 3D scans of the 36-year-old African patient, Andemariam Teklesenbet Beyene. The geology student currently lives in Iceland where he is studying for a PhD. Using these images, the scientists at University College London were able to craft a perfect copy of Mr Beyene's trachea and two main bronchi out of glass. They then coated this was then flown to Sweden and soaked in a solution of stem cells taken from the patient's bone marrow. After two days, the millions of holes in the porous windpipe had been seeded with the patient' own tissue. Dr Alex Seifalian and his team used this fragile structure to create a replacement for the patient, whose own windpipe was ravaged by an inoperable tumour. Despite aggressive chemotherapy and radiotherapy, the cancer had grown to the size of a golf ball and was blocking his breathing. Without a transplant he would have died. During a 12-hour operation Professor Macchiarini removed all of the tumour and the diseased windpipe and replaced it with the tailor-made replica. The bone marrow cells and lining cells taken from his nose, which were also implanted during the operation, are able to divide and grow, turning the inert windpipe scaffold into an organ indistinguishable from a normal healthy one. And, importantly, Mr Beyene's body will accept it as its own, meaning he will not need to take the strong anti-rejection drugs that other transplant patients have to. Professor Macchiarini said this was the real breakthrough. "Thanks to nanotechnology, this new branch of regenerative medicine, we are now able to produce a custom-made windpipe within two days or one week. "This is a synthetic windpipe. The beauty of this is you can have it immediately. There is no delay. This technique does not rely on a human donation." He said many other organs could be repaired or replaced in the same way. A month on from his operation, Mr Beyene is still looking weak, but well. Sitting up in his hospital bed, he said: "I was very scared, very scared about the operation. But it was live or die." He says he is looking forward to getting back to Iceland to finish his studies and then returning to his home in Eritrea where he will be reunited with his wife and young family, and meet his new three-month-old child. He says he is eternally grateful to the medical team that has saved his life. Amazing! Cannot wait to see the emergence of more complex synthetic organs, but this is a great start. This needs to be done for the heart. A real human heart that's exactly the same as the biological one. And also for the liver and kidneys. If scientists can do THAT, many many lives will be saved. And bless the hearts of those that survive long enough for this technology. It's on the timeline now. http://www.futuretim...rgan-transplant I've contacted Harvard Bioscience to ask if I can use a better image. Fantastic development. How complex could this get? Could we be talking about synthetic limbs? sure, 5-10 years down the read even liver and hart organs could be replaced, i15 years tops. Anyone else get wierded out by the pic? Anyone else thinking how much money there is to be made in synthetic vaginas? Sorry to lower the tone but you know it will happen. What about synthetic but engineered to take out flaws? If you mean by improving on what was there before, enhancing, perhaps with in 50 years, after all we have just started to dwell in to genetics, give a take few decades we'd be able to do all sorts of stuff. I'm quite convinced by 2028 we'll be able to slow down if not even halt human aging, this is mare 17 years from now, after that sky is the limit. Wow. Anyway, good thing that stuff is on the inside. Doctors have treated only three leukemia patients, but the sensational results from a single shot could be one of the most significant advances in cancer research in decades. And it almost never happened. The results of the preliminary test “exceeded our wildest expectations,” says immunologist Dr. Carl June a member of the Abramson Cancer Center's research team. The Penn scientists targeted chroniclymphocytic leukemia (CLL), the most common type of the blood disease. It strikes some 15,000 people in the United States, mostly adults, and kills 4,300 every year. Chemotherapy and radiation can hold this form of leukemia at bay for years, but until now the only cure has been a bone marrow transplant. A bone marrow transplant requires a suitable match, works only about half the time, and often brings on severe, life-threatening side effects such as pain and infection. In similar past experimental treatments for several types of cancer the re-injected white cells killed a few cancer cells and then died out. But the Penn researchers inserted a gene that made the white blood cells multiply by a thousand fold inside the body. The result, as researcher June put it, is that the white blood cells became “serial killers” relentlessly tracking down and killing the cancer cells in the blood, bone marrow and lymph tissue. Doctors had told Bill Ludwig, one of the research volunteers, that he would die from his leukemia within weeks. Then he got the experimental treatment a year ago. With tears welling up, he told NBC, "I'm more closer to the people I love and I appreciate them more... I'm getting emotional... the grass is greener and flowers smell wonderful." So why has this remarkable treatment been tried so far on only three patients? The researchers did manage to get a grant from the Alliance for Cancer Gene Therapy, a charity founded by Barbara and Edward Netter after their daughter-in-law died of cancer. The money was enough to finance the trials on the first three patients. With results for the three patients published Wednesday simultaneously in the New England Journal of Medicine and Science Translational Medicine, money for further studies -- not just in this one type of leukemia, but in other cancers -- will likely pour in from both the government and drug companies. It is important to emphasize that there still have been only three patients. Over the past century, many attempts to harness the body’s immune system to fight cancer have shown initial success and subsequent failure. So much research remains to be done to prove just how good this treatment is. But it should begin soon, with great vigor. Once scientists can get their hands on powerful quantum computers, I suspect that most diseases and cancers won't have a chance. An engineered virus, injected into the blood, can selectively target cancer cells throughout the body in what researchers have labelled a medical first. The virus attacked only tumours, leaving the healthy tissue alone, in a small trial on 23 patients, according to the journal Nature. 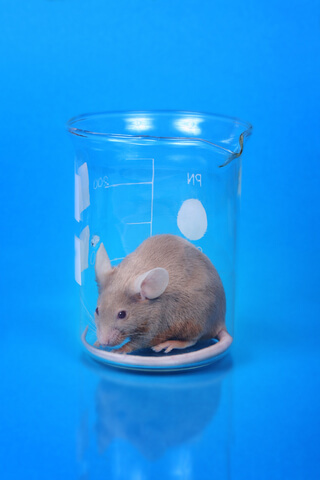 Researchers said the findings could one day "truly transform" therapies. Cancer specialists said using viruses showed "real promise". Using viruses to attack cancers is not a new concept, but they have needed to be injected directly into tumours in order to evade the immune system. Scientists modified the vaccinia virus, which is more famous for being used to develop a smallpox vaccine. The virus, named JX-594, is dependent upon a chemical pathway, common in some cancers, in order to replicate. It was injected at different doses into the blood of 23 patients with cancers which had spread to multiple organs in the body. In the eight patients receiving the highest dose, seven had the virus replicating in their tumours, but not in healthy tissue. Prof John Bell, lead researcher and from the University of Ottawa, said: "We are very excited because this is the first time in medical history that a viral therapy has been shown to consistently and selectively replicate in cancer tissue after intravenous infusion in humans. "Intravenous delivery is crucial for cancer treatment because it allows us to target tumours throughout the body as opposed to just those that we can directly inject." Infection prevented further tumour growth in six patients for a time. However, the virus did not cure cancer. Patients were given only one dose of the virus as the trial was designed to test the safety of the virus. It is thought that the virus could be used to deliver treatments directly to cancerous cells in high concentrations. Prof Bell acknowledges that the research is still in the very early stages, but he said: "I believe that some day, viruses and other biological therapies could truly transform our approach for treating cancer." 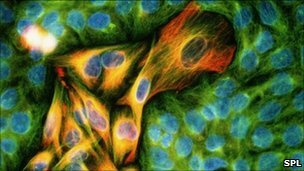 Cancer Research UK's Prof Nick Lemoine, also director of Barts Cancer Institute, said: "Viruses that multiply in just tumour cells - avoiding healthy cells - are showing real promise as a new biological approach to target hard-to-treat cancers. "This new study is important because it shows that a virus previously used safely to vaccinate against smallpox in millions of people can now be modified to reach cancers through the bloodstream - even after cancer has spread widely through the patient's body. "It is particularly encouraging that responses were seen even in tumours like mesothelioma, a cancer which can be particularly hard to treat."